OK, I know, this isn’t exactly exciting stuff. I’ve described this process on other coats, so this is primarily for the benefit of my sew-alonger. These techniques are taken from The Bishop Method of Clothing Construction, a book from 1959 that I refer to often. The author, Edna Bishop, comes across as an imposing but somehow lovable tyrant. The cuff is turned up and pressed. The hem on the sleeve is 1.5 inches. A 2.5 inch wide strip of bias cut haircanvas is placed in the hem so that 1 inch of canvas extends beyond the raw edge of the sleeve. I baste it temporarily in place. 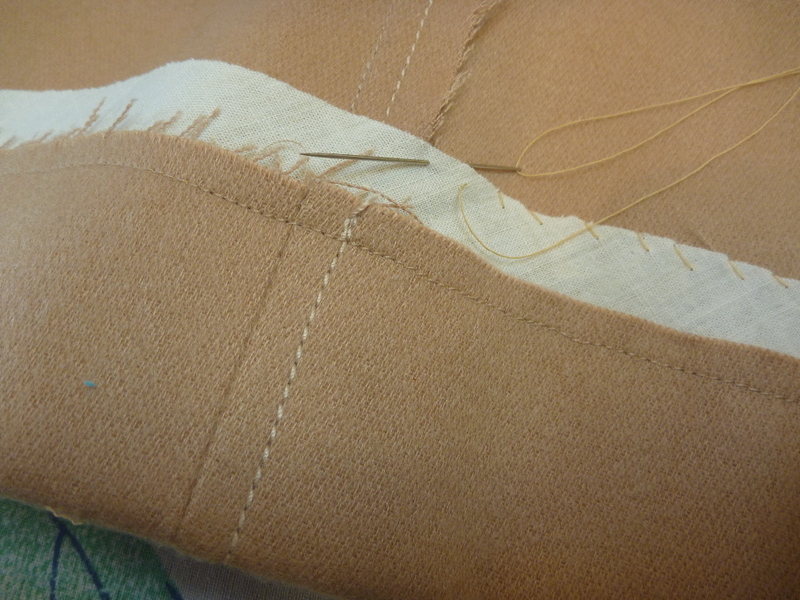 The edge of the sleeve is then stitched to the canvas with a 1/4″ seam allowance. This is much easier to do on a free arm machine. On my 301 it’s a PITA. 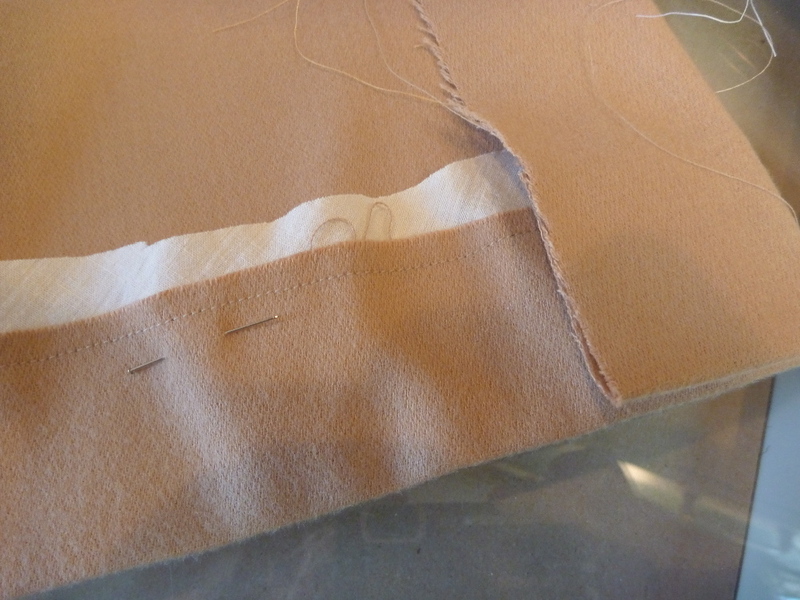 The hem is turned up and the canvas is slip stitched to the sleeve. This produces a cuff with a little “oomph” to it. I think this is desirable on any outerwear. The hem of the coat is treated in a similar manner. At the hem, however, a 2.5 in. strip of bias cut muslin is inserted. The muslin should run in under the facings and vent flaps just a bit. Maybe 1/2″ . 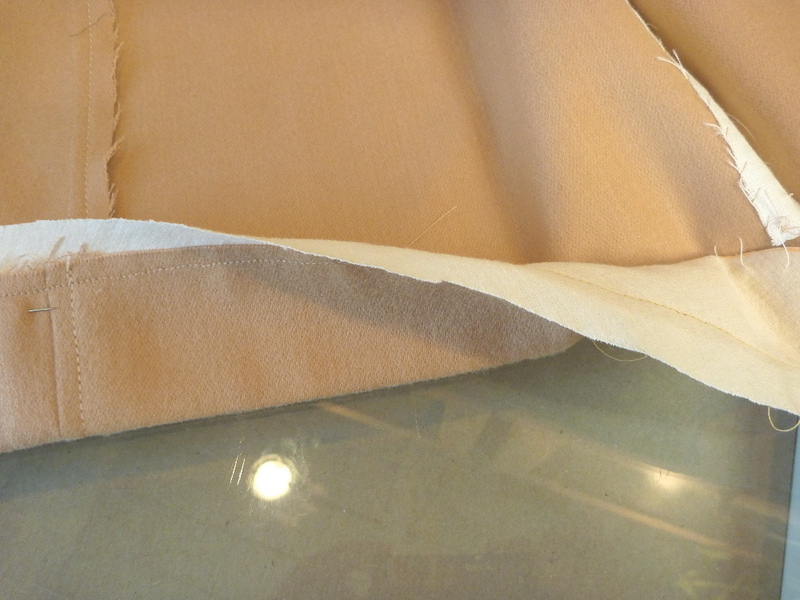 Again the muslin is stitched 1/4″ from the raw edge of coat fabric. 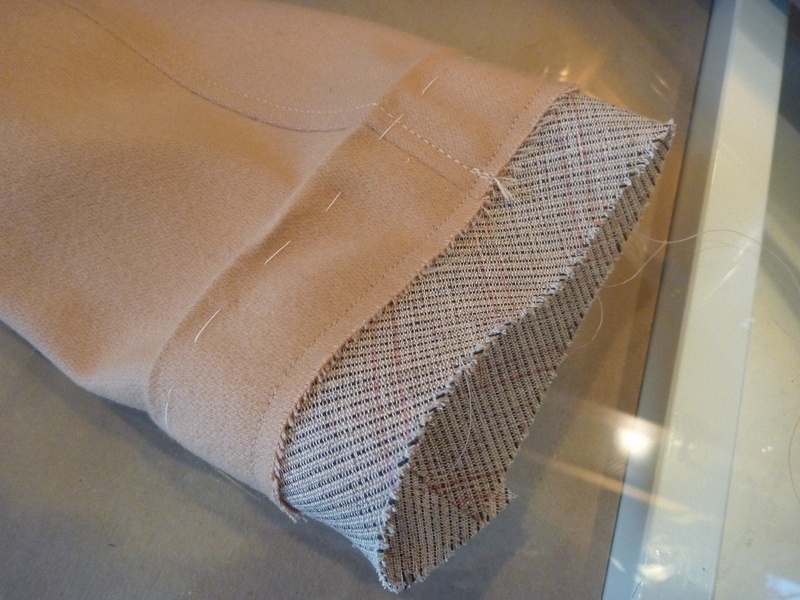 The muslin is then slip stitched to the body of the coat. 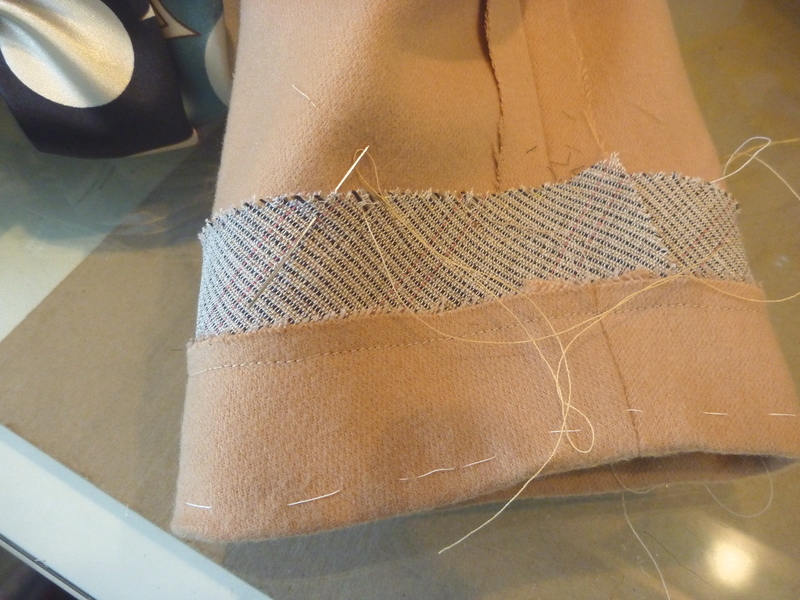 I don’t have a picture, but the raw edges of the facings and vent flaps are cross stitched to the turned up hem. It might not look pretty, but it will eventually be almost entirely covered by the lining. Just came across your blog — great work! You work on projects that interest me. Looking forward to your next project. Very cool the way you machine stitched the hem edge first to the interfacing. I have always done it the hard way first stitch the interfacing by hand to the garment and making sure there is a fold of it in the actual hem fold and then hand stitching again the fabric edge to the interfacing. Love your clear photos and progress! I am actually in the formulative stages of making my own coat. I have the fabric on order (olive green wool/cashmere blend) and am on my way today to find lining, interfacing, etc. I really need a winter coat (yes, it does get cold in Tennessee). My last succumbed to moths so this is a real need. I have wondered, do you have any experience with fur? There are sources online for natural pelts but I don't know quite what to do with them to make a detachable collar. It's not a necessity, just would be fun and something I've always wanted. I hope my coat turns out as well made and neatly put together as yours seems to have. Thanks! Wow, I have no idea how to work with fur, but it sure would be an exciting addition!